King Gambrinus, known as "the patron saint of beer," has long been a universal symbol of beer and brewing. Particularly during the late nineteenth century, the image of Gambrinus was used by countless brewers to promote their products and remind consumers of the rich heritage of beer-making. Many breweries were even adorned with life-size statues of the King. But who was Gambrinus? It is Gambrinus who brought beer to earth, and here is the legend of how this came to pass, and how he came to be King: Gambrinus was a poor apprentice in glass-making, hailing from a little town in the Flandres called Fresne sur l'Escaut. With his wonderful pink cheeks, blonde hair and blonde beard, he was the most beautiful boy in the town and had great romantic success with the town girls. But Gambrinus had secretly fallen in love with the beautiful daughter of his master, Flandrine. In those times, glass makers were noble from birth, and taught their art only to their sons. Flandrine, as proud as she was pretty, wanted to marry a master glass maker like her father, grandfather, and great grandfather. Gambrinus, as an apprentice, would only prepare the glass for his master, who then skillfully puffed it into decorative sheets. At last, Gambrinus gathered the courage to reveal his feelings to Flandrine. But Flandrine, offended that such a lowly apprentice sought her affection, refused so strongly that Gambrinus left Fresne, and vowed never to return to glass-working again so that he might forget about Flandrine forever. So Gambrinus wandered from town to town playing his violin and writing poetry to sing along while he played. Gambrinus, who was very clever and a quick-learner, soon gained a reputation as one of the best violinists in the region. He was constantly called on in towns far and wide to liven up weddings, birthdays, and other parties. When the people of Fresne heard of the fame Gambrinus had achieved, they could barely believe it. They were so proud of their Gambrinus that they invited him back to Fresne and threw a town-wide celebration in his honor. Gambrinus, flattered by the thought of a celebration in his honor, accepted the towns invitation and returned to Fresne. When he arrived in Fresne and began playing his violin, the delighted townspeople began to sing and dance and cheer. But soon after Gambrinus had started playing, he noticed Flandrine in the crowd. Overcome by nervousness, Gambrinus began to tremble. He trembled so much and played his violin so horribly that the townspeople began to kick him and shout at him. The townspeople all blamed Gambrinus for the commotion, since it was his poor playing that upset everyone. Gambrinus soon found himself arrested by the town officials and spent a full month in jail for the trouble he caused in the street and the noisy disturbance he had caused in the night. When Gambrinus was released from jail, he decided the only way he could ever make himself forget about Flandrine was to kill himself. He decided to hang himself, and headed out into the forest to set up a noose and platform. Gambrinus slid the noose over his neck, but just when he was about to step off the platform, he saw before him the devil himself. As is his custom, the devil proposed a deal to Gambrinus: if his power was not strong enough to make Flandrine love Gambrinus, the devil would oblige Gambrinus to forget Flandrine forever. This in exchange for Gambrinus' soul in 30 years time. Gambrinus accepted the deal, and agreed to the devil's terms. As soon as Gambrinus returned to town, he noticed an intense desire to gamble on games. Indeed, the devil meant to turn Gambrinus' love for Flandrine into a passion for betting. Gambrinus bet on everything he could, not caring whether he won or not. But win he did, and soon Gambrinus found himself the owner of a small fortune. Although gambling had nearly eclipsed any thought of Flandrine, Gambrinus suddenly had an idea. Because he was as rich as a prince, perhaps Flandrine would agree to marry him as a noble. Gambrinus approached Flandrine for the second time and expressed his feelings to her. But Flandrine's rejection was as swift and as ruthless as the first time: Gambrinus wasn't a noble; he was born a boy, and would remain a boy for life. Gambrinus, returned to the forest to see the devil and ask him what went wrong; after all, Gambrinus still had not forgotton Flandrine, nor had Flandrine been made to fall in love with Gambrinus. Suddenly, before Gambrinus' eyes appeared a large field with long lines of poles on which green plants began to grow. Soon the poles were covered by these green, perfumed plants. "These," explained the devil, "are hops." Just as quickly, two buildings burst forth from the ground. "The first building is a hophouse," said the devil, "and the second one is a brewery. Come, and I will teach you how to make beer, Flandres' wine. Beer will help you to forget Flandrine." Gambrinus learned how to make beer (not without tasting it every now and again) and found it delicious. Gambrinus soon felt like singing and dancing and playing his violin. But he remembered that the last time he had played violin he had been arrested, and his violin destroyed. Gambrinus asked the devil how he might seek revenge against the townspeople of Fresne who kicked him, sent him to jail, and broke his violin. The devil gave Gambrinus a new instrument that no one could resist, and taught Gambrinus how to play it. The devil explained that this instrument was called the chimes. The devil gave Gambrinus some seeds and the chimes and sent Gambrinus back to Fresne. Once he arrived home, Gambrinus planted the precious seeds given to him by Belzebuth, and practiced making beer and playing chimes. One morning, Gambrinus set up tables, chairs, barrels, and chimes on the main town square and invited all the townspeople to join him to sample his new drink called beer. The townspeople tasted the beer, which was a brown lager. At first the people complained: "It is too bitter," "It is too stong." The people soon began laughing at Gambrinus and his stupid drink. Then Gambrinus began to play the irresistable chimes. The people all began dancing and could not stop. All the dancing made the people thirsty, which encouraged them to drink more beer. After an hour or so, the tired and woozy townspeople pleaded with Gambrinus to stop playing chimes. But Gambrinus kept playing for hours and hours. Gambrinus was satisfied that he had gotten his revenge on those who had wronged him. But after time the townspeople began to appreciate the beer. They begged Gambrinus to make more and called beer the best drink they ever had. Word of Gambrinus' drink spread far and wide and crossed over all frontiers. People from other towns soon begged Gambrinus to bring beer to their towns. Everywhere Gambrinus went, he brewed beer and played the chimes. So impressed were the nobles of the region that the Dukes, Counts, and Lords offered Gambrinus the title "King of Flandres." Gambrinus accepted the position of king, but said he preferred the title "King of the Beer." From thence on, Gambrinus was known as "The Brewer King." When Flandrine realized that Gambrinus would never come to her again, she came to talk to him. Gambrinus, however, more than a little inebriated, couldn't recognize Flandrine, and just offered her something to drink; indeed, Gambrinus had forgotten about Flandrine. Gambrinus lived happily with his subjects for many years, until finally the devil returned. "Thiry years have passed since we made our deal," said the devil. "Now you must follow me." But when the devil turned around, Gambrinus began playing the chimes, and the devil began to dance. The devil begged Gambrinus to stop playing, but Gambrinus continued, and the devil could not stop dancing. Finally, the devil agreed to break his deal with Gambrinus, releasing Gambrinus from his end of the deal. 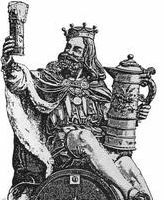 King Gambrinus lived happily for another half century playing chimes and making beer. When Gambrinus finally died, his body disappeared, and in its place appeared a barrel of beer. This is why Gambrinus has no tombstone, and why no one knows of the resting place of The Brewer King.